This spacious custom built home with spectacular views is situated on a large and very private plot in the exclusive and well established residential area of Kamares Village. 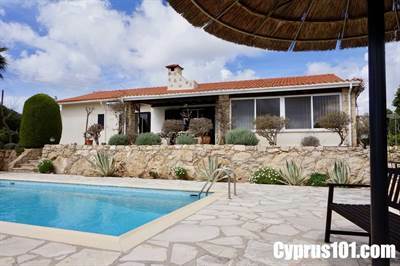 The popular Kamares Clubhouse with restaurant facilities, swimming pool, tennis courts and adjacent medical centre is near by and the many amenities of Paphos Town are a short 10 minute drive away. The property has been well designed with great attention to detail to create a unique, energy efficient and practical family home. It has an interesting mix of modern and character finishes and is built to a high standard including damp course and wall/roof insulation. At the entrance to the property is a gated driveway with double size garage to the side, including two separate, electrically operated up and over doors. To the rear of the garage is a workshop/storage space and on the roof are 12 photovoltaic panels with inverter, changing the solar electricity produced into a form compatible to be fed into the national electricity grid, resulting in highly reduced electricity bills. The accommodation features a comfortable living room with feature stone fireplace and wood burner fire, formal dining room, conservatory, modern kitchen with limed oak fitted units, breakfast room, separate utility room and guest WC. A hallway leads from the entrance foyer to the master bedroom with large en-suite bathroom, including sunken bath, separate shower and fitted vanity unit, two further double size bedrooms and a family size bathroom, also with sunken bath and vanity unit. Sliding patio doors from the living room, conservatory and master bedroom provide easy access to a spacious covered veranda with stunning sea and mountain views. Steps lead down from the upper terrace to the mosaic tiled swimming pool with corner roman steps, surrounding sunbathing terrace and beautifully landscaped gardens. To the side of the property is a further large patio area with purpose built barbecue area, store room, wood store and boiler room. Below the pool terrace is the remainder of this substantial 1400 sqm plot and here there is potential for further landscaping and/or the creation of secluded outdoor seating areas. This impressive Kamares Bungalow is perfect for those looking for a quality permanent residence or private holiday retreat. ← Previous Previous post: Price Reduced! Villa in Kamares – New Listing with Stunning Sea & Mountain Views!